This morning, I was invited by Franki Sibberson to record a podcast for Choice Literacy, thinking broadly about the changes in technology and writing instruction over the past few years as well as the teaching approach that I outline in The Digital Writing Workshop. Here are the questions that she sent me ahead of time, with some brief answers that guided our conversation. 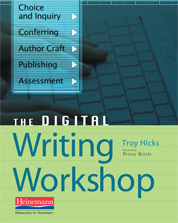 Can you define Digital Writing and Digital Writing Workshop for us? 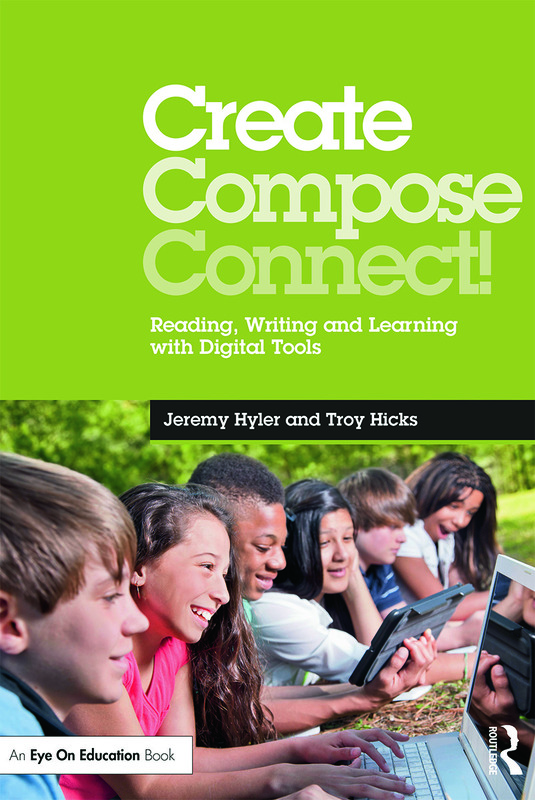 The digital writing workshop, then, is (to use the contemporary term) a “mash up” of digital writing and the writing workshop. 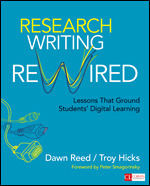 For most teachers, then concept of the writing workshop — where students have choice in topic and genre, teachers use mini-lessons and conferring to guide writing, and students share, respond to, and publish work — is familiar from noted teacher researchers and scholars such as Lucy Calkins, Nancie Atwell, Penny Kittle and many others who come from that school of thought. Thus, blending the digital writing with the workshop approach leads us to a digital writing workshop. Why do you think it is an important thing for teachers to think about? Since it is impossible to separate the act of writing from the use of technology (even pencil and paper are technology, right?) we need to think more and more about what digital tools such as computers, smart phones, video cameras, and other devices allow us to do (or, in some ways, not do) with our writing processes and products. Writing and technology are intertwined, and as we continue to think about how the shape of writing is changing in digital spaces, teachers should always be thinking ahead for how this will affect students’ literacy practices. How have you seen the needs of student writers change in the last few years? In some ways, it’s the same as it ever was: students still need time, materials, and space to write. They need to have consistent, thoughtful feedback from teachers and peers, and, sadly, they need to pass those tests. 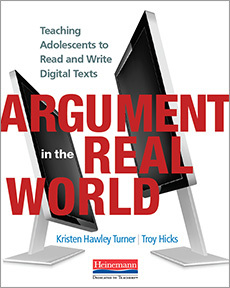 Yet, as students adapt their writing to other digital spaces, for instance on social networks and text messages, they don’t always see what they are doing as “writing.” As teachers of writing, this is something that we need to help them understand. Purpose, audience, situation. These will always be the constants in writing, even if the modes and media continue to change. What’s different/What’s the same when it comes to writing workshop? One key difference, obviously, is the technology. Ideally, we would all be working in a 1:1 environment where we are able to teach tech tips alongside elements of craft in digital writing spaces. Yet, we know this is not the case; some teachers and students have limited, if any, access. So, I think that we need to keep thinking about principles, no matter if you are working in a 1:1 situation, or if you are only in the computer lab once a month. What are you able to do, reasonably, given the time that you have access at school? What can you expect students to do outside of school with mobile devices or on other computers with access? We have always had some writers who excel and some who struggle, so those students will continue to be present in a digital writing workshop, yet we need to be especially sensitive to the technologies that they have available. What role does technology play in digital writing? As I mentioned above, technology plays a role in all writing. Even three years ago, it might be that someone wanting to create a digital story would need to have a digital camera, a personal computer, and a voice recorder. Now, for those who have access, they can do all of that with a smart phone. So, as technologies converge on our devices, I think that it will become easier and easier to create thoughtful, well-crafted digital writing. Still, having access to a full suite of tools including digital cameras, modern computers with lots of RAM and storage, and fast internet is still important. How do you balance the tools with the teaching of writing? To me, this is like the “teaching grammar in context” type of question. When we teach sentence combining, we can integrate a discussion of the semicolon vs. the colon, and that makes more sense than handing a student a worksheet. For digital writing, it is much the same. At the moment in the digital story when something needs to show a transition, then it is time to pull up the screen with the choice of transitions and talk about them. Why might you want to fade to black rather than have a page flip? 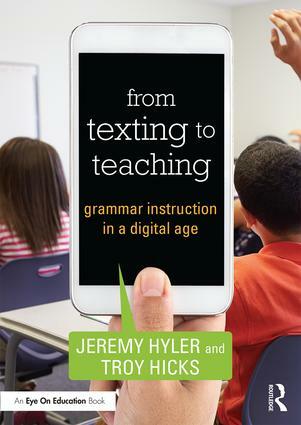 Teaching the technology in the context of the writing process is what makes the digital writing workshop approach more than just “integrating technology”; instead, it is talk about the craft of digital writing. Do you think that the craft of writing changes because of all of the new tools and new formats available to writers? Indeed, as I mentioned above, I think that the craft changes. What makes an effective “hook” for a traditional essay may, or may not, work in a podcast or in a digital story. Having a slide with a title may be appropriate in some shows, in others it may not, although essays almost always have titles at the top. 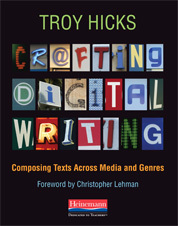 So, as with any genre study, we need to think about what makes good digital writing in a variety of contexts. What is a good way for teachers to start incorporating more digital writing into their classrooms? Pick on digital writing technology and go for it. For me, that tool would be a wiki. Look at a few examples, watch a tutorial on YouTube, and dive right in. The students will help you figure things out. Other than your books, what are some resources, websites, etc. that you would recommend to teachers about Digital Writing Workshop? Who are the other experts we can learn from? Also, anything by Clay Shirky, Donald Tapscott, danah boyd, Jason Ohler, Will Richardson, Sherry Turkle, Chris Anderson, Tim Wu, or Henry Jenkins would be useful to understand the broader context of digital media and learning. Critics of digital media, who we need to read, understand, and argue against, include Nicholas Carr and Mark Bauerlein, and I am sure that there are more. Teachers/researchers that I read and respect include: Sara Kajder, Carl Young, Bud Hunt, Robert Rozema, Allen Webb, Danielle DeVoss, Punya Mishra, Matt Koehler, Charlie Moran, Anne Herrington, Rick Beach, Kathi Yancey, Doug Hartman, Jeff Grabill, Ellen Cushman, Gail Hawisher, Cynthia Selfe, Dickie Selfe, and many more and more that I am sure I have forgotten in this list.